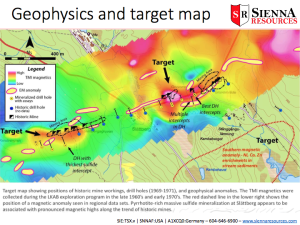 Sienna Resources (SIE—TSX.v) (A1XCQ0 –FSE) (SNNAF—OTCBB) is pleased to announce that it has engaged Protek Norr AB of Sweden to drill Sienna’s Slättberg Cobalt-Nickel-Copper Project in Sweden. Drilling is expected to commence shortly. Earlier this week Sienna significantly increased its acreage on its Slättberg Cobalt-Nickel-Copper Project. The Slättberg Cobalt-Nickel-Copper Project now consists of 3 exploration licenses covering 12,733 acres and at least 16 historic mines, with 1 being the historic Mårtanberg copper mine, which was operated in the late 1700’s and early 1800’s. The Mårtanberg field is known for its copper-rich skarn-style mineralization. The underground workings extended to depths of 80-100 m, and little to no modern exploration has been conducted in the area. We plan to bring modern techniques and views to this added acreage.